Waste generated from processing of marble, granite, quartzite can be used for manufacture of pebble mesh products. 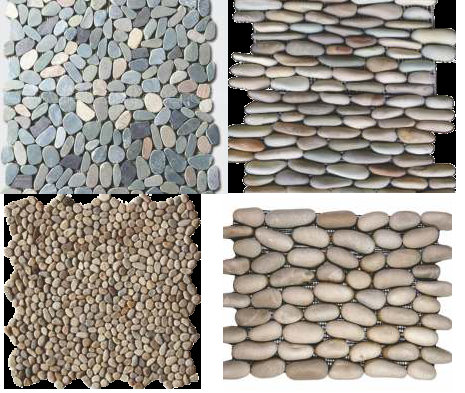 The sizes of stone chips, range from 0.8 to 1.2 cm; 1.2 to 1.7 cm and 2 to 3 cm diameter. Different chips are made of waste stone in different sizes and these pebbles are pasted on the fiber net. This is prepared as “ready to use” tiles in sizes of 33x15cm, 30x30 cm and 30x10 cm in single colour or multi-colour with attractive designs. There is lot of value addition as the final product in different sizes is sold at a high price. Making of pebbles require manpower in cutting the waste in to pieces and operating a tumbling machine. Finally stone pebbles are pasted on synthetic fiber net by woman workers. Unskilled workers are required for subsequent packing and final dispatch. While pebbles can be made from available marble, granite, quartzite and quartz surfaces, waste from imported marble and granite can also be used for making pebbles and finally pebble mesh tiles. These tiles can be used in floors of lobby and interior as also in bathrooms and kitchen walls.